OK, Plot 1 is mostly a desert. This changes my entire RP plan. With so many fewer converts, so much less to industrialize, the entire operation will take 12 less years. Most of my growth will remain in the homeland. As a minor concession, could I at least have a river in the NW region for water, arbitrator of geography? Ze' kommies kontrol ze' oil now! Next time you update the map just note that I am now the United States of Gracealona. We all know my country's government is set up exactly like the USA's so I just thought I'd change the name to reflect this. During the next update (which I assume will be the Oct. 9th deadline or Demboss's claiming of a plot), will EG remain on the map, or will the month of leniency be used? He said he wasn't coming back, so he will be removed, and his territory will become a single plot (it used to be two plots). k updated the map. Now it is the entire world divided into plots, instead of just Terragon. Claim and expand and colonize to your heart's content! A resource map is in the works. It will be followed by a climate map, and then a "disasters map" which will show where certain disasters are likely to happen (IE Hurricanes, Flooding, Volcanoes, Earthquakes, etc) and then that will be followed by a tectonic map. First and foremost: Rasvidi, I think I speak for the entire region when I say, "AWESOME!" and thank you most sincerely for the effort that you have put into this map and all the maps that you have done. You are a credit to this region and I am thankful for your talents and willingness to use them for our benefit. Secondly, Plot [redacted] is mine. Touch it and die. Redacted for the fun of blowing someone up who touches it. Can my name be changed to the United States of Gracealona on the map? That's what my name is now. 1. )It seems to me this way everyone is going to start getting really spread out. 2. )I know this would be hard to fix without re-claming plots or re-drawing the map but I have to point this out. It seems to me that the plot sizes are a bit small, I mean considering this is an earth size world these plots would each be about the size of, I don't know, Honduras about? Well thats why my original intent was to make it larger then Earth. But no these plots are bigger then honduras for sure, it's more on the scale of your typical European country such as Germany or France or Spain (Edo Edi Essum's territory was actually modeled after Spain). 1: I would prefer to be spread out. Keeps away all the grubby little fingers reaching for my resources. It also keeps nuclear missiles comfortably far away. I love the new map. 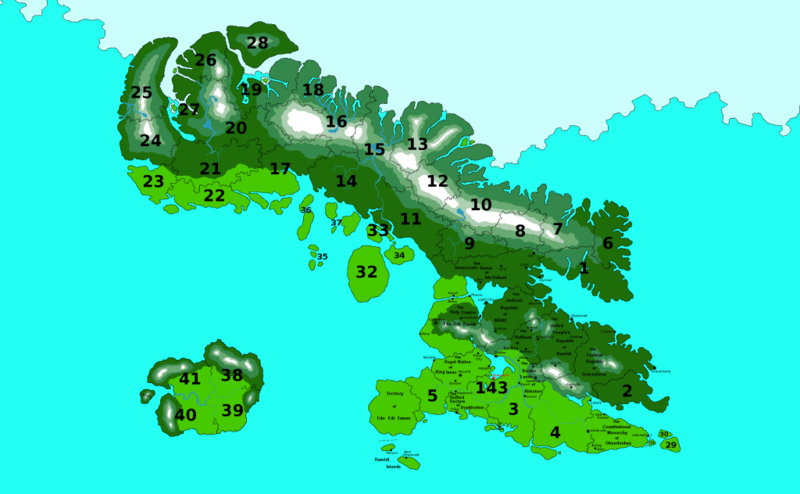 Is there a resource map or a climate map available? I would appreciate that. I feel like expansion will be a little insane. Couldn't we limit ourselves to the current continent? All the world's nations currently occupy a tiny fraction of global land. We need a much smaller globe. The entire Eastern and Southern hemispheres should be axed. It's just not reasonable for a region with less than 80 nations. Save the map for later if we have incredibly high growth. In conclusion, I love the map, but it's entirely irrational. We need to limit ourselves to only a larger continent, for the sake of sanity. Hmm, that's not allowed, you can only have one nation on the map. Although this has me thinking about letting people create new (not old) nations after they roleplay the establishment of a colony. You can be on any continent you want. Wow. This map is much bigger, awesome, and has over 40 vacancies. Why would we need a hundred more? I agree, and there's still plenty of room for those who want to be further away as well. As Secretary of Culture, I hereby block off all areas of map outside of what EEE has posted. There's plenty of room. The rest of the map will be accesible as we grow and have fewer and fewer available spaces. Hijjma, sorry but you will have to choose a different spot, inside the area specified above. Remember, you can only have one nation, and if you want a colony then you need to roleplay it after you are placed on the map. Also, is there a resource or a climate map available? Thanks.